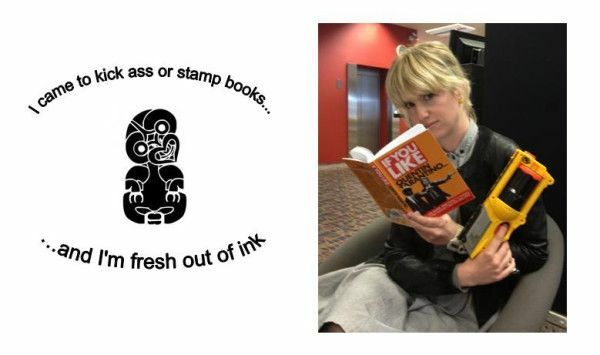 On the eve of the Auckland Libraries children’s and youth librarian conference New Rules of Engagement: A Hui of Awesome Awesomeness (PDF download), I’m joined by one of our guest speakers, Adrienne Hannan. She’ll be showing Australian and Kiwi librarians how to run a thrilling educational Nerf gun activity. I’m the children’s and youth coordinator at Wellington City Libraries. We have an unusual structure for a large library system – I’m the sole specialist responsible for all Child and Young Adult (CYA) services in our 12 libraries. We have a number of regular and not-so-regular special events and activities that run throughout all our libraries and, while our branch librarians run them, I’m responsible for their success. I am required to ensure that we have the necessary funding, resources, time and people to run CYA services, and make sure our librarians are up to the task. I also do the marketing and promotion for CYA services (print and online), contribute to the website and social media content and run blogs and online book clubs. I write many reports and business cases, recognise service gaps and endeavour to fill them. One area I don’t have responsibility for is the collection, though I do work closely with that team as required. It’s a big job, and I LOVE it. In my spare time (*snort*) I’m a Combat Medic in the New Zealand Army Reserve Forces. I have been a soldier for 5 years now, and completed my basic soldiering and infantry training in 2009 before completing medical training. My role is frontline medical support which means I specialise in treating combat trauma, battlefield resuscitation, stabilisation and evacuation. We are trained to provide medical support to frontline soldiers and often on the ground where they are fighting and while the fire fight continues around us. Medics are non-combatants; which affords us special protection under the Geneva Convention. Generally, we are only allowed to fight to protect ourselves and our patients and not to advance the frontline and win the fire fight. Regardless, I’m required to have an in-depth knowledge of infantry methods and tactics because I will normally find myself up at the frontline or out on patrols working with them. Hence why I am a Combat Medic. Being a soldier is one of the toughest jobs there is. It requires mental, physical and emotional fortitude and stamina. I am part of a close-knit team that are required to achieve the objective regardless of the weather, terrain, time of day, whether you have eaten or slept adequately, or even if you don’t agree with the mission. Respect is not a given, you have to work for it. On the other hand camaraderie is automatic – you learn very quickly how to get along with everyone and find common ground. Military training and work is great for personal development. I have been tested again and again in situations that expose my true nature – I know who I am. I know when I’m likely to crumble; and I know when I’m going to stand up solidly. All my strengths and weaknesses have been exposed, and I’ve been enthusiastically encouraged to eliminate each weakness one by one (usually in the middle of the tussock in Waiouru while standing in freezing rain, by an ugly sergeant yelling at me from about 2cm away). I have coping mechanisms to deal with the tough days at work, or if I’m feeling stressed. I work hard, and achieve the mission (or at least do my darndest to). I’m also a whizz with a band-aid (essential librarian skills). On the downside, I’m terrible at adhering to Health and Safety requirements. Correct book handling at the returns desk on a Monday morning just seems a strange thing to consider when I‘d spent the weekend throwing grenades and learning how to dismount from a rolling vehicle without stabbing myself with one of my own scalpels or bayonet. What could librarians learn from the way the military approaches delivering on its missions? The military get things done, no matter what the odds. They work hard in any condition and circumstance, and all effort is focussed on achieving the end objective. Flexibility and moving quickly is key; they must adjust when the situation changes. People at the front are taught to think, and not just be robots. The military achieves its missions through leadership, rather than management. There’s a theory, called “The Strategic Corporal”, that those at the front are the ones that makes the most important day-to-day decisions, rather than the generals who sit well back from the frontline. The decisions that those at the front make can affect the outcome of the mission or the war. They are the face of your forces – the ones that the enemy and the civilians see, and they represent what your military is about. Done incorrectly at the frontline, a split second decision or a poor reaction to a situation, can damage your reputation, turn the population against you or change the direction of the mission or war. 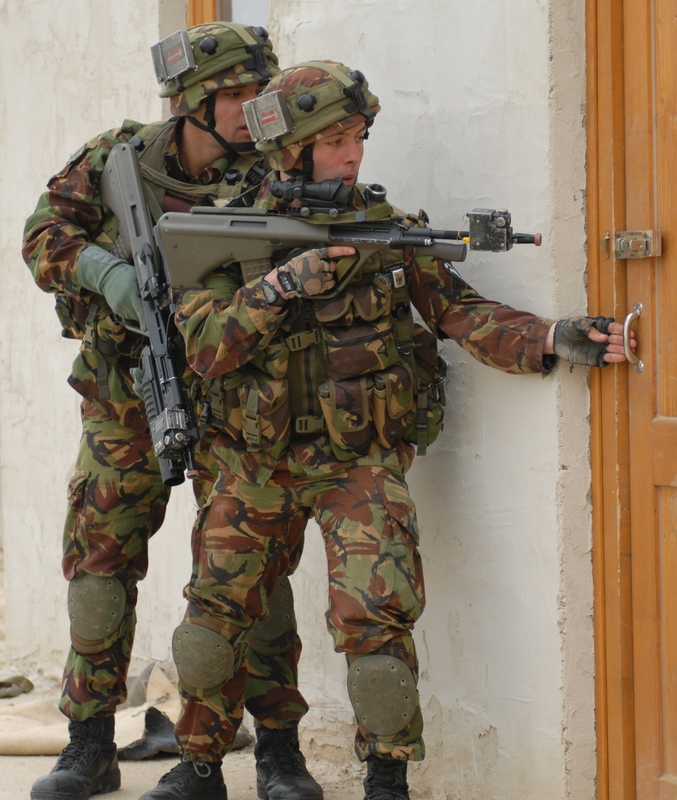 In the NZ Army it is recognised that those at the front need to have the complete picture and all the relevant information, in order for them to do their jobs. They need to know the intent of the mission, the reasons behind the mission –history and background, they need all the context, and they need to understand the desired outcomes, and then be trusted to achieve them. They need to be trained to make good decisions, rather than be told what they are to decide and have soldier that blindly follow orders without appropriate application to the situation. They can’t be robots – they must be highly trained, informed, professional, responsive and flexible. They need to be able to react appropriately to all situations and make sound decisions. These frontline soldiers and leaders are the most important people in the military –it all goes wrong and gets deadly if they get it wrong. This can be translated into library-land. Our front line librarians are our most important people in our organisations – they are the face of your library system and they are the decision makers that our community members see on a day-to-day basis. They need all the info, they need to know what we are trying to achieve as an organisation, they need to know what resources they have available and where they can be used, they need to history leading up to their current state and the reason behind the high-level decisions that have been made in their organisation. All this information will make them excellent librarians – they will make sound strategic decisions on the front desk and will be able to deliver a result to the customer without having to go through unnecessary hoops while they gather the information and permissions. They can deliver on the library’s missions and objectives on a day to day basis and are able to take initiatives without prompting. Stay tuned for more from Adrienne later this week.